From the makers of Miracle Noodles comes Miracle Rice! Shirataki rice that is guilt free, zero calories, soy free, and gluten free. 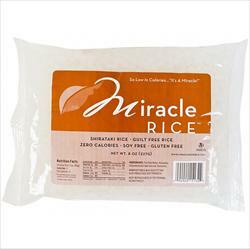 Miracle Rice are zero calorie, zero carb, and zero glycemic index rice made only from fiber. Storage: 4 months in the refrigerator or 2 months non-refrigerated.